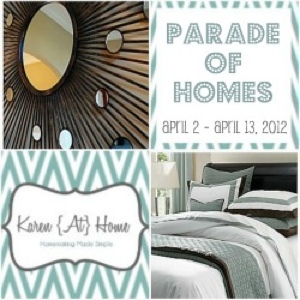 Today I have the pleasure of linking up with my friend Karen of Karen at Home for her Parade of Homes tour. Karen has a newborn baby at home, so while she’s maternity leaving she asked a few folks to stop by and guest blog for her. My friend Jenna at The Hamlett Daily Dose showed off her beautiful house yesterday, and today my house is up for a look-see. The Parade tours will run through Friday, April 15th, when Karen will be hosting a big linky party for everyone to link up their own home tours! Please join in the fun! This is what being a design blogger is all about to me! I love home tours. It’s also a really great way to look back at all the projects that we’ve accomplished in the house and see just how far we’ve come. I admit that for the first few months of living in this house I was feeling pretty overwhelmed. I spent many, many hours on pinterest and houzz and design blogs trying to figure out exactly the direction I wanted to head. I was so conflicted because on the outside the red brick is so formal and traditional, but that was NOT what I wanted inside at all. Formal and stuffy was the LAST thing I wanted inside my house. Once I let go of that feeling that the outside needed to match the inside I was able to come to a nice in-between place with a mixture of coastal cottage, shabby chic, rustic country, french provencial, with some traditional southern design and funky happy colors woven all through it. I feel like the house is finally in a place where I’m truly thrilled with the results. It feels more like “me” than any house has in a long time. I’m glad I let go of some of my preconceived interior design notions and made it my happy place. Please check out more at Karen’s blog. And start getting your post together if you want to link up, too! « Recreating Pottery Barn Style Without Buying A Thing From Pottery Barn: My Rustic Home Office Reveal. Your home is just amazing Beth! I have received so many positive comments on it, everyone is just in love with it. It sounds like you are too! Thanks so much for opening your home to my readers!! Thanks for the tour of your home. It is gorgeous! :-)I love all the trees and your landscaping, too.